When Blissbook launched in late 2013, we felt pretty good about what we knew and what we were launching. We combined our knowledge of the policies and procedures industry that we acquired over 1-2 years of research with the momentum we saw behind engagement initiatives and the growing sentiment that company culture is something companies should invest in. It made a lot of sense. Unfortunately, the real world often doesn’t make sense. In the real world, people don’t act rationally. It may seem like they do from the outside, but if you dig deep enough, you’ll find it’s usually an illusion. Looking back with that knowledge, we realize we knew a lot less than we thought. 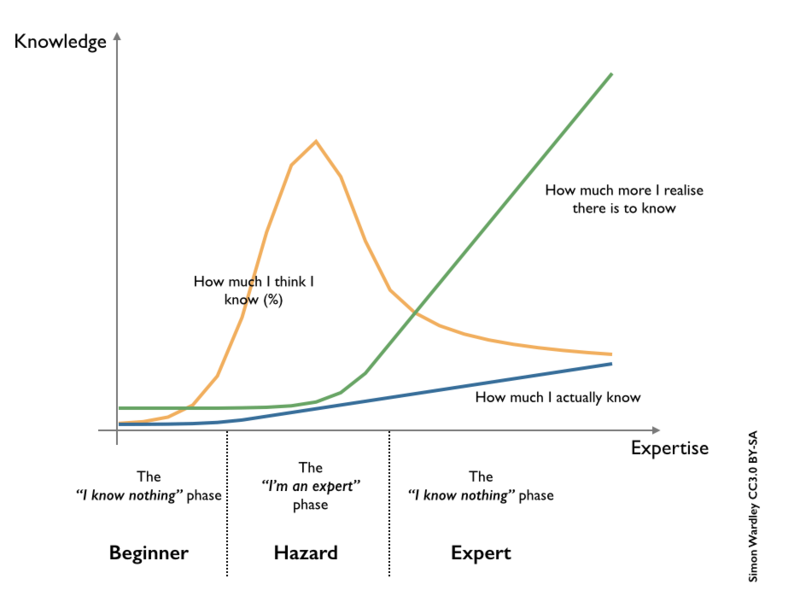 I’d say we were at the beginning of the “I’m an expert” phase shown below. In late 2014, after an intense 6 months of startup engineering education, we decided that we knew nothing. Or, at least, not enough. Not only that, we were burned out. So although we remained committed to serving our existing Blissbook customers, we weren’t sure what to do next. We took a break and in addition to taking on some consulting work with Home Depot (our team has deep, real expertise in designing and building software), we built a completely unrelated product in a totally different market. And a funny thing happened. During our time away, we realized we were wrong. We didn’t know nothing. We knew a whole lot more than nothing. Once we had the time to reflect, we realized that although there is still much to learn, we do know something and we do have a unique perspective on the market Blissbook is in. We’re somewhere in the beginning of the “I know nothing” Expert phase from the chart above. It means Blissbook is back, and it’s about to get a whole lot better! One of the main things we learned from the 400+ people we talked to during our startup engineering education is that people in HR are often asked to be a guide and a gatekeeper at the same time. This is a problem because the two roles are often mutually exclusive. How can you be an employee’s guide and partner if your job is to say no? So that’s what we’re working on. Our mission is to help you protect your company and show employees that you care and your company cares – at the same time. What does that mean for Blissbook? (1) Your move to a digital employee handbook doesn’t put your company at risk. This means you should be able to do everything with a digital handbook that you used to do with paper (and more). Features like e-signatures, robust reporting, being prepared for an audit, different content for different groups of people, and more should be powerful yet easy to use. You shouldn’t have to go through IT, marketing, or an external graphic design company to create or maintain a beautiful, on-brand employee handbook that your employees can access 24/7 from any device. Monday, we’ll be posting some new features that are a part of our latest release. But they’re just the beginning. If there’s anything YOU’D like to see in the new Blissbook, please let us know.